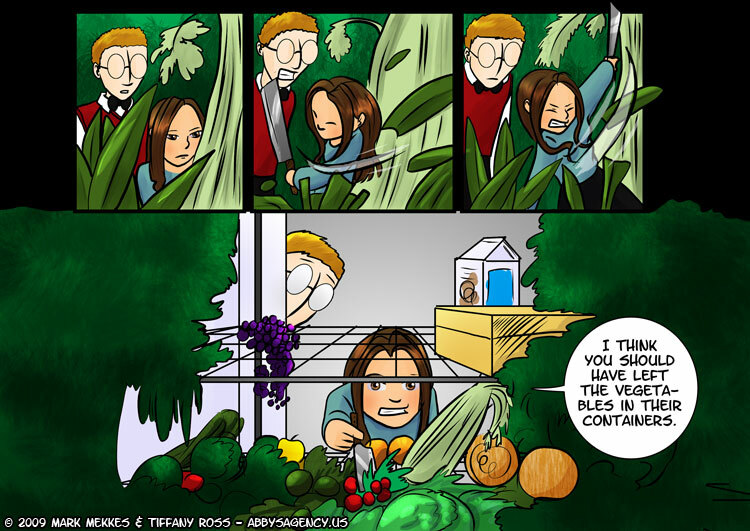 ABBY I think you should have left the vegetables in their containers. Now that’s is food taking over. I wonder where she got the her trimming blade? When food takes over, cut your way to the fridge. You need that kind of blade to open coconuts. I like how Brain is hiding in the last panel. What the heck did he buy that grew that quickly? It’s a dangerous thing when the celery takes over! Use coffee! it worked before! They got a jungle growing the house! WTF!